Although I love a good kitchen gadget just as much as the next food writer, the truth is that my drawers are bursting with unused tools. I usually like to take the simpler approach to cooking and prepping, and for everyday cooking, I find that the best gadgets are usually the ones that do more than one thing. 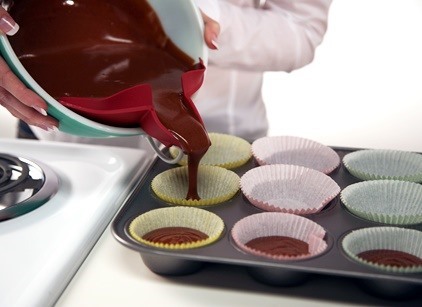 Meet the multipurpose Silpoura, the spout which helps with straining, baking, and multiple other cooking needs. For less than $10, it helps makes things easier and neater in the kitchen. 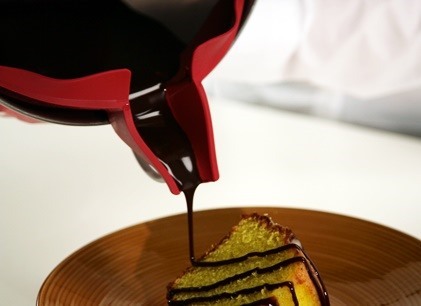 The Silpoura is a funky tool, which, while compact, will probably not be the prettiest gadget you have in your kitchen. It makes up for its lack of looks by being useful, however. It only comes in fire-engine red (they used to sell a green one) and is made of food-grade Japanese silicone. It's dishwasher-safe and can withstand food temperatures up to 450°F. It also fits many different containers, from bowls to large pots, as long as they don't have large lips. 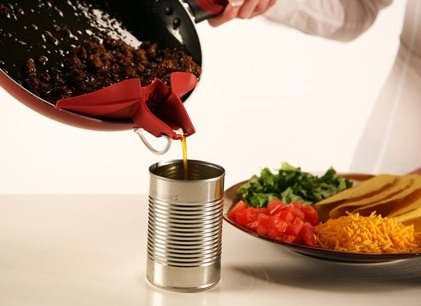 You clip the spout onto pots or bowls when you need to strain food like vegetables or pasta, drizzle chocolate or cake batter, or drain off grease or liquids. It can also double (or triple) as a spoon rest. 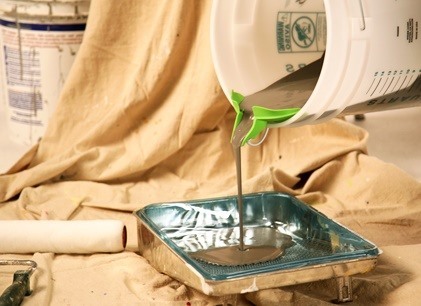 It helps make pouring and straining easier and neater once you get used to clipping it on securely. I received the Silpoura as a gift for my RV kitchen, and although I've learned to appreciate some of the joys of camping, cooking in tiny quarters (or outside) is not something I find charming. 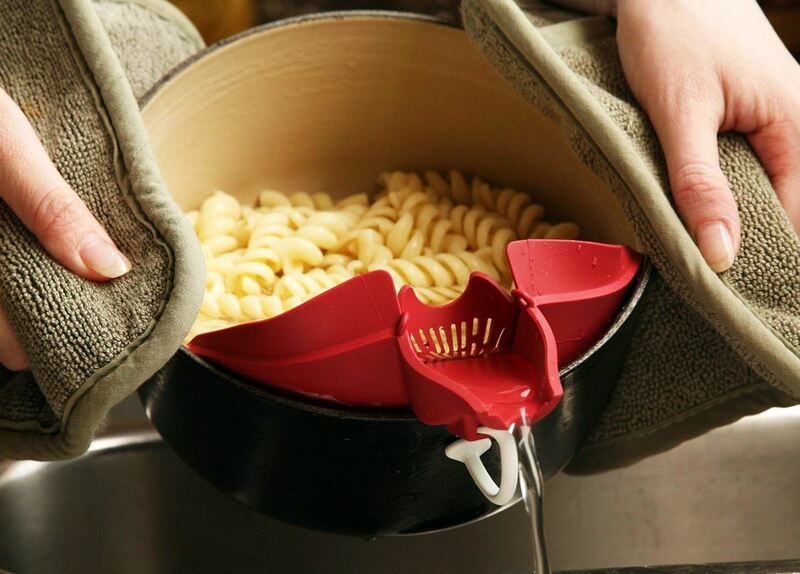 Because it eliminates your need for a separate strainer and helps with messes, the Silpoura makes cooking in a small kitchen, a boat, an RV, in dorm rooms, or on outdoor camping trips much easier. After using it on a few trips, it wasn't a big surprise to me when I found out that the Silpoura was invented by a couple on a camping trip. 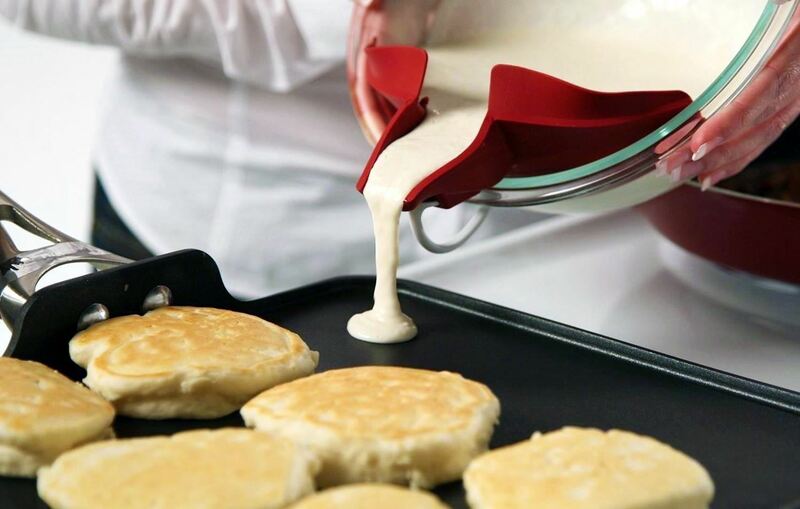 Even if you have enough room to spare and don't need it as a strainer, you will find the Silpoura spout useful for the precise pouring of pancake batter, muffin batter, and for chocolate drizzling, soup pouring, and grease draining. Check out all the multiple uses for the Silpoura in the videos below (you can see more here). If you're already convinced you want one, it's easy to buy online. There are also copycat versions available, too.